A 15 month project to catalogue the archives of the Friends Emergency and War Victims Relief Committee (FEWVRC) has now been completed, making accessible the records of an unprecedented Quaker relief effort during and after World War I. 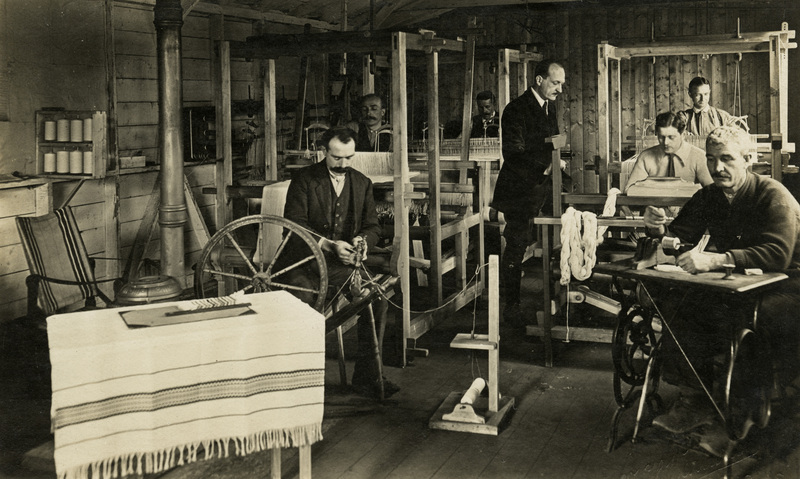 The project, one of many Quaker activities to mark the centenary of World War I, was funded by the Joseph Rowntree Charitable Trust. It includes a display of photographs and other items from the collection, available to view in the Library and online. In line with the Quaker peace testimony, many Friends refused to bear arms and instead, as part of the Society of Friends’ Christian and humanitarian witness, undertook relief work in war ravaged areas. Soon after the outbreak of World War I, a Friends War Victims Relief Committee (FWVRC) was formed to carry out this work, taking the same name as the committee formerly set up to assist victims of war and famine during the Franco-Prussian War of 1870-1871. The relief workers faced appalling and often dangerous conditions. During the war, building, medical help and agriculture were three key areas of work undertaken by the FWVRC in France, where entire villages had been razed to the ground by the fighting and thousands of people displaced. 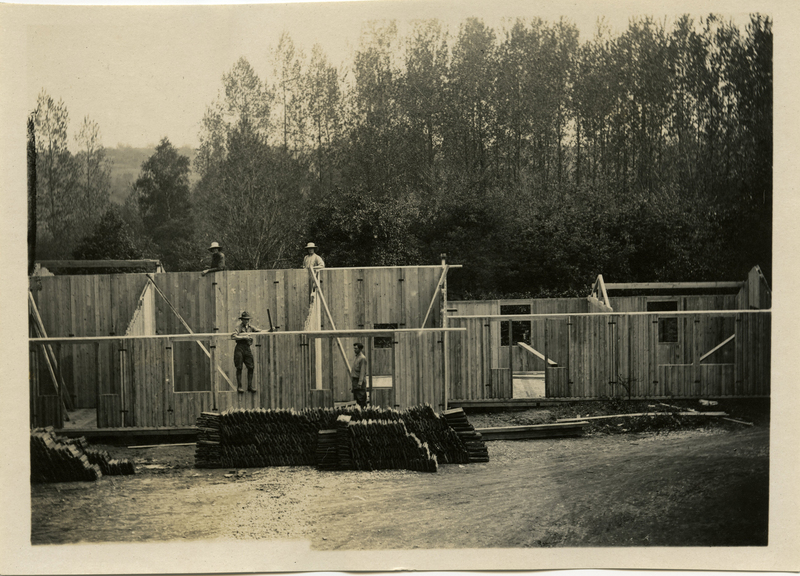 Prefabricated buildings were constructed to meet the urgent needs of those in the war zone. By 1916 communes like Sermaize-les-Bains, that had been little more than rubble, were transformed by the construction of houses. In Verdun and the departments of the Meuse and Aisne over 1,300 houses were built, giving homes to 4,500 people. Friends took charge of hospitals, implemented a district nursing scheme, and provided dental and eye care as part of the medical services they offered. Châlons Maternité Hospital was opened to help pregnant and nursing mothers: during its three years in Quaker hands it cared for 3,789 patients, saw the birth of 981 babies and had an infant mortality rate of less than 5% – an astonishing feat considering the time and conditions. Farms in the war zone were decimated and harvests almost completely lost. Teams with mechanical threshers were sent out to villages each season. As a result, in 1917 alone 900 tonnes of cereals, which would have otherwise been lost, were threshed in regions receiving Quaker help. A machinery repair service was set up, complete with forges and supplies of spare parts. Veterinary care was provided, livestock, including bees, were reared and given to peasants, and 24,000 fruit trees were distributed among 130 communes. Meanwhile, in Britain Quakers had concerns about the situation faced by “enemy aliens” interned in prison camps, their families and prisoners of war shipped from Europe. A large German population lived and worked in the country, many of them long term residents. With the declaration of war those who were reservists returned to Germany, while those who remained were interned in prison camps, sometimes leaving dependent families destitute. Stephen Hobhouse raised the matter at Meeting for Sufferings on 7 August 1914 and in December 1914 an Emergency Committee was formed. Despite accusations of “aiding the enemy” and “hun-coddling”, the Emergency Committee gained the patronage of many public figures and was registered under the War Charities Act 1916. Much of its early work was directed at finding homes for stranded people and assisting British women who had married German or Austrian men and lost their British citizenship. Such was the demand, volunteer caseworkers assisted 30,000 Germans in London alone. Early internees were detained in unsuitable accommodation in appalling conditions. 700 civilians were crowded into a derelict factory in Lancaster. Men were kept in horse boxes on Newbury race-course or lodged in ships at Southend and Portsmouth, without heat, lighting or adequate sanitary facilities. These were eventually replaced with internment camps across Britain. The Emergency Committee’s Camps Sub-Committee was established in November 1914 and given the rare privilege of a general permit to all camps, helping to expose abuses, suggest reforms and hear grievances. James T. Baily, who became an Industrial Adviser, was permitted by War Office regulations to “advise” but not “initiate” schemes for education and industry in the camps. These facilities saved many internees from despair and enabled some to send small sums of money to their families. In post-war Europe relief efforts were continued by the now amalgamated Friends’ Emergency and War Victims Relief Committee (FEWVRC). Russia was one of the recipients of its dedicated efforts. 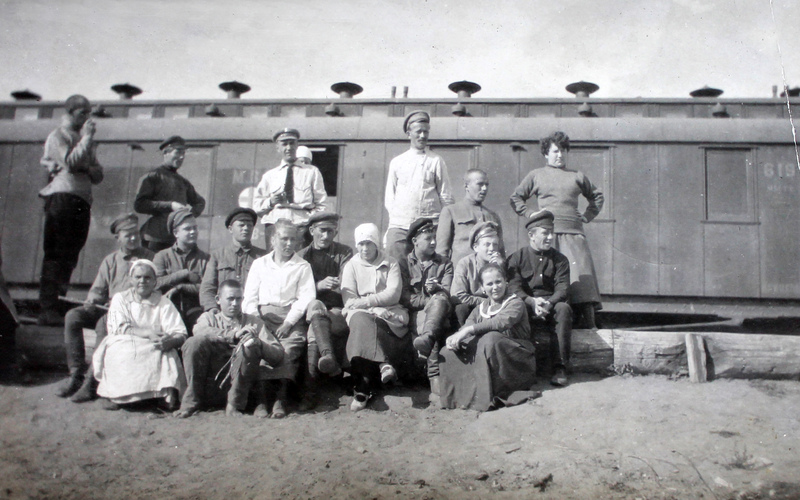 Following the October 1917 revolution, relief work in Russia foundered. The Allied blockade remained in place until 1921, although famine was inevitable . The Foreign Office and the new Soviet government opposed Friends’ return to Russia, but in January 1920 the Foreign Office was persuaded to approve the export of goods for use in children’s hospitals, and Hinman J. Baker entered Russia as one of three International Commissioners to supervise the distribution of foreign relief. By July 1920 several colleagues had followed, and a combined feeding scheme with the British Save the Children Fund managed to supplement the rations of 16,000 Moscow children. 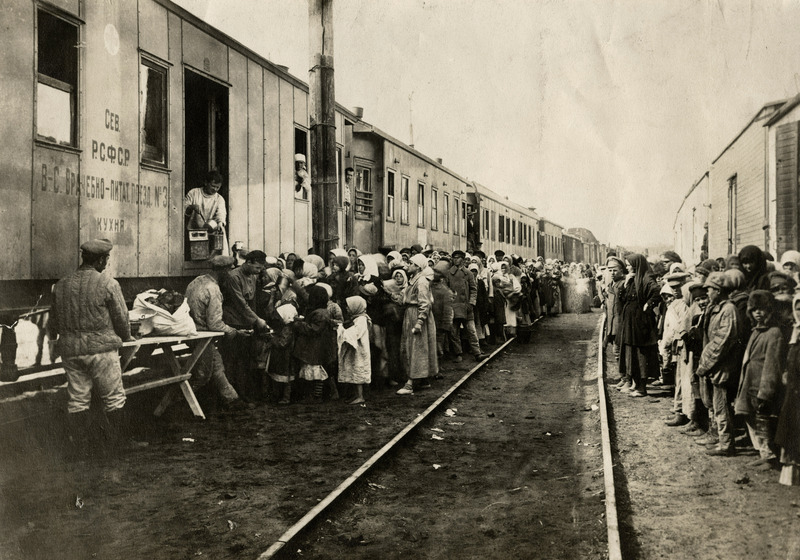 However, relief had only reached accessible places: Anna Haines, accompanying a Russian party to Buzuluk in 1921, found conditions so bad that food supplied by the Friends relief mission was diverted from Moscow to Samara town and district. Along with 30 wagons of government food, a kitchen that could prepare 5,000 ration meals, and a dispensary, Quaker relief work began in the area. As more workers became available they managed to distribute supplies across the wider region. Some journeys took two days; horses, weak from hunger, could hardly pull supplies and typhus was an ever present risk. But eventually there were 900 feeding points in 280 villages. The lack of doctors, nurses or medical supplies meant famine related diseases such as typhus and cholera spread quickly. Despite high numbers falling ill, disease was fought by elementary means such as cleaning and disinfecting houses. Twelve clinics were established and in one medical programme alone nearly 30,000 people received a course of quinine tablets. Feeding and medical schemes like these ensured tens of thousands of Russian people were saved from starvation and disease. The Friends Emergency and War Victims Relief Committee catalogue (YM/MfS/FEWVRC), encompassing the records of the FWVRC, Friends Emergency Committee, and the combined FEWVRC, is now searchable online and a printed copy is available to browse in the Library reading room. The accompanying display of items from the collection can be seen until April 2015, or see the online version here. This entry was posted in Projects and tagged archives, cataloguing, France, Friends Emergency & War Victims Relief Committee, refugees, Russia, war relief, World War I. Bookmark the permalink. I have the letters, pictures and travel documents made by Bernard Ireland Macalpine (BIM), while he was in the Marne, Meuse, and Ardennes – are you interested ? Hi Su, I was planning to visit the Archives of La Marne to view Bernard Macalpine’s papers! Are they now in the Friends’ Library? Thank you. Hi Linda, we have not taken these papers in as yet. However the full collection is now available online, digitised by the Archives de la Marne: https://bit.ly/2sasKus so you can peruse online at your leisure! 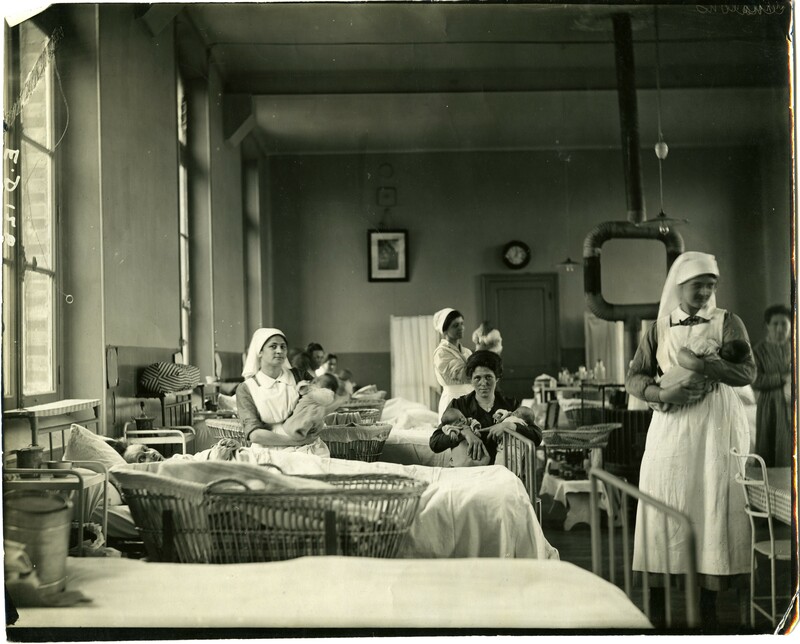 I am Helping build an Exhibit on WWI COs and am looking for information on one of the men who stayed in France and worked in the hospitals and helped rebuild. He was a part of the Friends War Victims relief committee. His name was Frank Farquar from Wilmington Ohio. If you have any available information let me know. Hi April, thanks for getting in touch, we will respond to you by email! Is4 there a list of those who served in the FEWVRC in WW1? If so where can I find it please? Thanks for responding so promptly. I am trying to find whether Fred Page served with the WVRC in WW1, and whether there was someone also there called Mark Hayler? If you can check this for me I would be very grateful, Jocelyn. We’ll have a look and email you.